A few short months after my husband and I got married, we were drowning in debt. But, we realized we could really use a short weekend getaway to just escape the madness and financial frustration. Of course, the issue with going on vacation when you’re broke is that you don’t have money to spend on any extras. So we decided to try home swapping. We were living in an apartment at the time. But, it was only a couple of miles away from the beach. We ended up finding an older couple to swap their mountain cabin for our one-bedroom (sorta) beach rental. We met the couple before handing over our keys and it was definitely a nerve-wracking experience. We were entrusting them with literally everything we owned and we only met them for about 10 minutes. As we drove away with the keys to their cabin, we considered turning around several times. We thought about going back to see if they had already looted the place. But in the end, stupidity, or naïvete, won out. We spent the weekend in the cabin for practically no cost to us. We brought our own food to cook so we didn’t even have to pay for eating out. Our story had a happy ending. We returned to our home, returned their keys, and nothing that we noticed was missing. These days, we own a house and still live in a pretty prominent tourist destination spot. It’s only a 15-minute drive from Disneyland, an hour from L.A., and 20 minutes to the beach, in a family-oriented neighborhood. And now that we’re strapped with a kid, and one on the way, our family vacation budget doesn’t stretch as far as it used to. So, we’ve seriously considered doing another home swap. But before you decide to do a home swap, there are some things you need to know. Here are five things you need to know about home swapping. Don’t just agree to swap with Joe Schmoe off the street. We were young and naïve when we swapped several years ago, and we won’t repeat the same mistake if we try home swapping again. A friend in New York has swapped her Brooklyn studio several times for international trips, and she always video Skypes with the swappers several times to work out logistics beforehand and to get to know them. She also researches as much as she can on the couple and checks out references and Facebook profiles. This helps provide a level of comfort with who will be staying in your home. You can find home swappers pretty much anyway. You can post on Facebook asking your extended network if anyone would like to swap, or perhaps you have an alumni network that would be interested. Maybe you know coworkers who are looking for a place for their extended family to live in while they visit, and you could stay with them. Personally, I find that a friend of a friend brings me a little bit more comfort than simply using a home swapping website. But, a home swapping website is still much more preferred than something like Craigslist. Highlight the benefits of your home and why it will be desirable to others. Whether it’s location, ambience, etc. What would make someone want to stay there vs just staying in a hotel room. You are essentially selling your home! 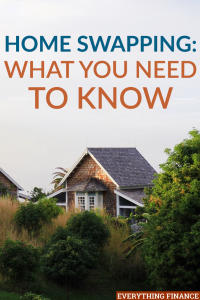 Know what it is you are specifically looking for in a home swap. A lot of people think that finding a swapper is the hardest part, but it’s not. In reality, it’s finding a good match that is the hardest part. Remember, it’s okay to turn down swappers when you know it’s not a good fit. Lastly, make sure to install some security measures before home swapping. We installed a front door camera that will alert us to anyone who enters and exits the home. This helps make sure that nothing fishy is going on without infringing on the privacy of the swappers. Also, I know plenty of people who install combination locks instead of giving out keys to their home for swapping. Don’t forget—the number one rule is to keep your family and your valuables safe! Home swapping is great thing to consider if you want to go on vacation but don’t have a large budget. But, make sure you think about the pros and cons before you decide to try home swapping. Have you ever tried home swapping? Would you do it to travel for cheap?